Cyclone Aila Support Group managed to raise 5,00,000 INR (appr 10,550 USD) through the facebook campaign. Compared to the devastation and the need in Sunderbans, this amount is quite small. However with guidance from Association for Conservation and Tourism, the money is spend on basic needs of the affected people. Charities Aid Foundation India is doing the due diligence, programme planning, funds disbursement, monitoring, auditing and reporting. Updates from us will be send to all donors. We thank all the organisations and people who raised awareness about the disaster. We salute the resilience of the people of Sunderbans and self-less work by our partners at Help Tourism who stood by the communities when they needed them the most." Seeing a posting on facebook for a volunteer to document the Cyclone Aila that hit the Eastern India on the 25th May 2009, Zainab Kakal went to Sunderbans to share the need of the people and give her insights into the disaster that affected millions of people in West Bengal and neighbouring regions. The following text and photos are from Zainab's personal journal that she maintained during her travel to Sunderbans. 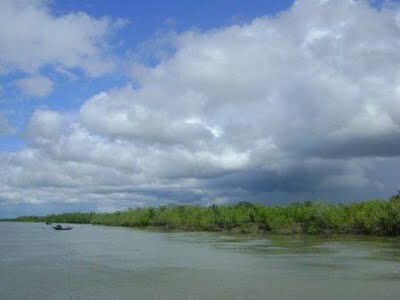 Arrival: (June 2009) "I enter the Sunderbans exhausted. The endless journey jumping from boat to boat through the riverines has taken about 4 hours and I am drenched and extremely skeptical. The Sunderbans, even to a tired eye looks like a marvel. It is close to being called mythical for it could not be real - it is the land of floating green islands. Haven't read the entire post yet but liked whatever I have. Did you make this trip on your own or did TISS arrange for it. @ Anusha: I made this trip on my own. The Blue Yonder had posted it online and I jumped at the chance! Tis a wonderful piece! More than a piece you 've captured a piece of Sunderban in ur pic and words and transported it to the world out here. For some moments lived the wetness, the slush, the moquitoes and the smiles! Loved it! Proud of the work you do! Keep making a difference - to yourself and the world around you! Zainab. Awesome article. Im an NRI and read about you The WeeK (June 2012 issue). I am ready to support blue yonder's activities. Certification makes green see red!